Based on the historical research from the original article by Ray Mudway. The VW Kubelwagen Type 82 was the German Army's work-horse through all of WWII. It was used in all theaters in different terrain and climate conditions. The dunes of Africa as well as the mud and deep snow of Russia showed the need to improve its off-road capabilities. 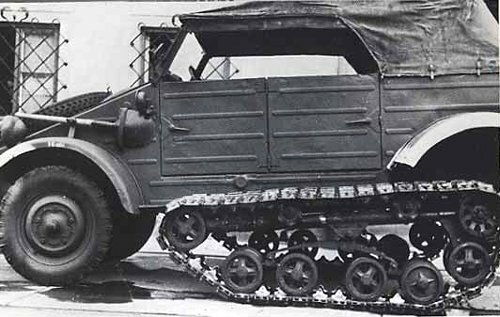 In 1942, the VW plant in Stuttgart began working on the Type 155 Schneeketten (snow-track) Kubelwagen. There were several quite different variants of suspension developed, and these were possibly all consecutively fitted to the same prototype. Some of them utilized parts of agricultural tractors produced by Porsche. Typ-155/0 initial prototype. Typ-155/1. Typ-155/2. Very simple type. Typ-155/3a. Typ-155/3b. Front skis added. Typ-155/4b. Simplified Horstmann design. The necessary modifications to the standard Kubelwagen were extensive. A skid was mounted on the nose, the brakes were reinforced, and the differentials were changed to optimize engine performance. In 1944, this was tested extensively alongside the Sd.Kfz. 2 Kettenkrad to compare their performance. These trials proved that the Type 155 was able to cover the most difficult terrain, but that the vehicle was very slow and forbiddingly inefficient. Its top speed was only 8 km/h, with fuel consumption of 150 liters/100km, which was unacceptable. The Type 155 was never produced.